Augmented Reality an old concept, are not very common words yet, to be very familiar with, but it’s such a thing that would take you to a whole lot of a different perspective of the world around you with its augmented reality apps. It combines 2 words to deal with, “augmented” means enhanced or increased and “reality”, which together simply means enhanced reality. By using hardware or tools such as your smartphones, you can discover such beneficial details in the form of visual data imagery that are not visible to you normally. Augmented reality is such an evolution which adopts new ways to add information discoveries to the reality in limitless possibilities from fun, games, sports and education to technology in engineering and medicine and more. Here is one video embedded below related to mobile apps in augmented reality by ‘Matt Gonzalez‘. The listed apps below are there in your android / iPhone devices to make you understand what it can do with the camera, GPS and other sensors to impress you. Let’s say you go to Beijing, a well-known city in China. Now you want to find out any vegetarian restaurant there (for example), but as everything is written in Chinese which you do not understand, you are unable to find any. That time, you take out your smartphone, connect to the internet and launch an app. This app looks with the rear camera and shows you what you couldn’t figure it out in actual view. You point your camera to next to next buildings and it would say “non-vegetarian restaurant”…” hotel”….”vegetarian restaurant” and there you get the right one to get you forward. Now, this is called augmented reality adding information to your reality in many ways. There are not just this type of augmentation but a wide variety of augmented reality apps which use augmented reality. 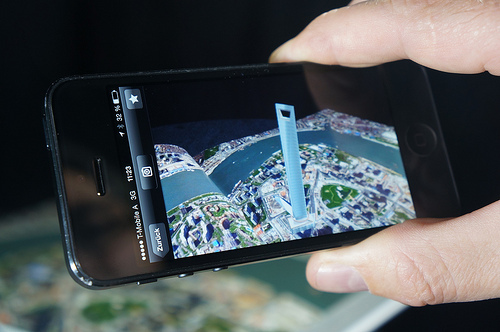 Augmented reality browser is an amazing 3D navigator to help you reach your location easily. Hold your smartphone upright and look around with your camera to view restaurants, hotels, landmarks, cinemas and other geotagged entries.Floating image balloons on screen display information of the chosen picture. Hold it horizontally to switch to Google Maps to show your position and pin it to view it later or find your parked vehicle. Integrated Facebook, Twitter and Flickr let you share and store location photos. Amazing Google app uses image recognition technology to deliver information about various logos, landmarks, barcodes or QR codes. Add contacts with business cards, read novel summaries by scanning the title, all by taking its picture. The power of Google search engine with your camera. Recognize DVDs, CDs, paintings, books. 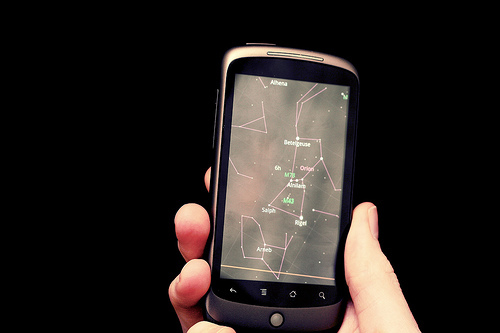 Think of yourself lying relaxed in one starry night under a clear sky, when you spot a constellation, but to know which it would be, point your smartphone camera towards the sky and Google Sky Map will tell you all about that constellation. Point to anything in the sky and you will learn all about it. Ultimate road safety app helps you with navigation on road trips and keeps you safe preventing collision on the roads ahead. Uses smartphone camera, GPS and other sensors to detect for getting off the road or moving too close to another vehicle, by generating an audio-visual warning. Simply mount your smartphone on windshield and iOnRoad starts automatically as you move. It detects when and where you are parked and helps you later to reach your parked car with the navigation and a clicked photo of the parked area. 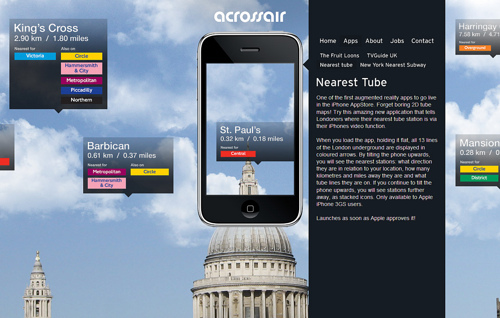 Best augmented reality app in 2011. Use the camera to browse at your surroundings and get information on landmarks, restaurants and other places. Find hotels, ATMs with favourite cuisine of yours from Qype, Yelp, Trip Advisor, Hotels.com. Wikitude World Browser is the best augmented reality browser in 2009, 2010 and 2011. Find services easily anywhere near you with this AR browser of your smartphone. 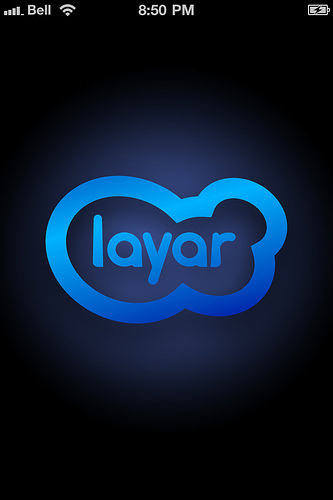 Use camera to scan any building or street corners and Layar will bring you over 3000 layers of digital information to choose from. Layar even displays tweets from nearby areas. Scan magazines and “make the print world clickable”. Save favourites and share anywhere. Save your planet from aliens. Everything around you turns into a warzone where you can point your smartphone anywhere with 360 degrees of view to find and shoot space invaders. Your smartphone becomes a window to this augmented reality. Invite your friends in multiplayer mode and recruit an army with them. As the name suggests, it’s a car finder app. Finding your car in a parking lot or at any other crowded areas seems a tough task when you’re in a great hurry. “Augmented Car Finder” uses your camera to search for your vehicle and give you directions to it and then shows you the street address closest to your parked car. Use your smartphone camera to look through wifi hotspots in front of you with their relative strengths and directions. The directions may or may not take you to the hotspot areas, but Lookator certainly helps you for a better signal. Think you go for a trip where you come across new places, landmarks and other things which you want to explore and find the details behind them. Instead of flipping your brochure pages, launch Tagwhat app and with the camera and GPS, it pulls out all the details from the web and social networks about any landmark you encounter. Read related stories, reviews and post your feedback with great sharing feature. Want to know what satellites are flying over your head. Well, you might not be an astronaut but with your android device just launch Satellite AR and point your camera in the sky to show you little icons of the satellites in view. Simply tap on the icon to know more about that particular satellite. Tired of using apps sitting indoors for long, this app SpecTrek would make you do some physical exercise with gaming. Go out in an open area and launch SpecTrek. Virtual ghosts will appear in your real world surroundings by just moving your smartphone in different directions to spot one and capture them with a net while running towards them. 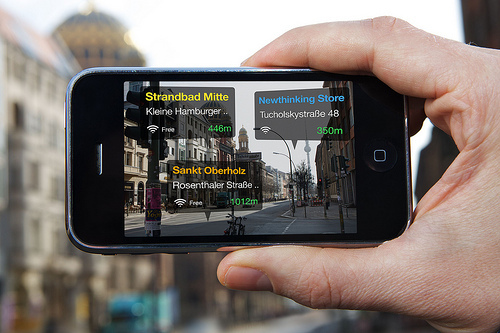 SpekTrek also provides you bonuses, titles and records to keep you going with this augmented reality app. Perfect app for adventurers with this amazing augmented reality compass which gives you mil-spec compass, gyrocompass, speedometer, sextant, angular calculator, inclinometer. It’s everything you need to have if ever lost in a jungle or any strange place with an option to save your location’s coordinates for keeping it in your records. Spyglass uses GPS to track your location in both Geo and Military formats. Optical rangefinder embedded to measure the distance between you and an object in sight. Track positions of Sun, Moon and stars to help you with navigation. 3D Compass+ gets you together navigation maps, a compass and local business finder apps all into one with an augmented reality view using the camera. It displays a compass on the screen and a map to navigate you through the directions to your desired location. You can adjust the brightness, directly from it for a clear view even in sunlight. 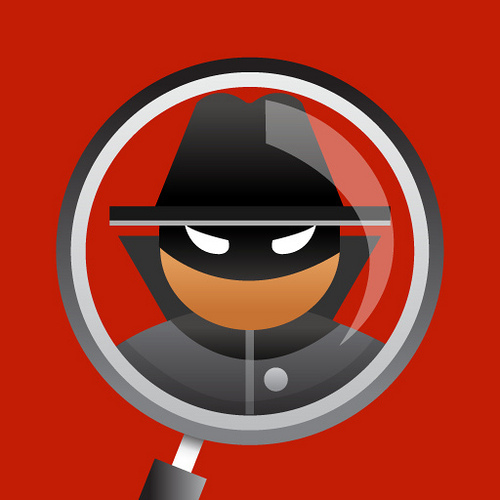 App by spotcrime.com to show and keep tracks of all the crimes near you or anywhere on the streets of your map. With GPS, it tells you whether you are taking a safe route or not. Point your camera towards a street and check if it is so. It shows you criminal records with different coloured icons for different types. If you are fond of storing different likeful colors to use them in the real world, then ” Augmented Colors ” gives you the means to catch your favourite colors and store them. It identifies RGB and hex values of a color and keeps the color code with you to use elsewhere. Simply get your desired color between the crosshairs and pin it. Useful for artists and graphic designers. You can share your colors. An augmented view from the Google Maps to show you only right directions on your smartphone camera. Follow the highlighted white light to reach your destination. Shake your smartphone 3 times to launch Yelp. Need help to find some hotel to stay in or any restaurant in an unknown street, Yelp will get you there. 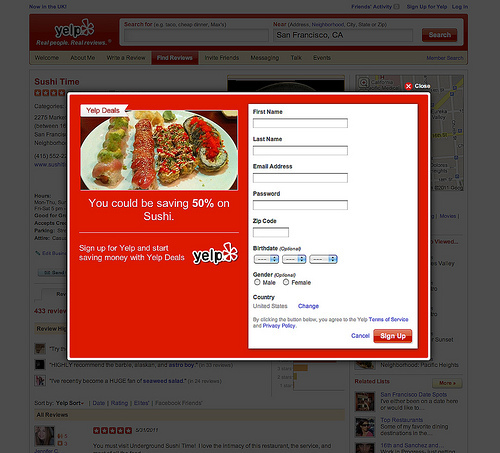 Yelp uses augmented reality to overlay information on your screen. Browse through the reviews and ratings by other fellow travellers. Custom Search allows you to figure out the choices by categories. Augment gets you to visualise 3D objects like furniture, books, characters in your desired rooms, halls and other places with the camera. Try new settings in your room without actually rearranging them. Now, select your 3D object from the gallery, point the marker on your camera at your desired place and there it goes. Your 3D object gets in place of the marker. With it showing an augmented reality view of the solar path, rise and set times, solar direction map and elevations for any hour of any day of the year, ” Sun Seeker ” can be much useful for architects, gardeners and even real-estate agents. Design your house accordingly to the sun exposure on your property. 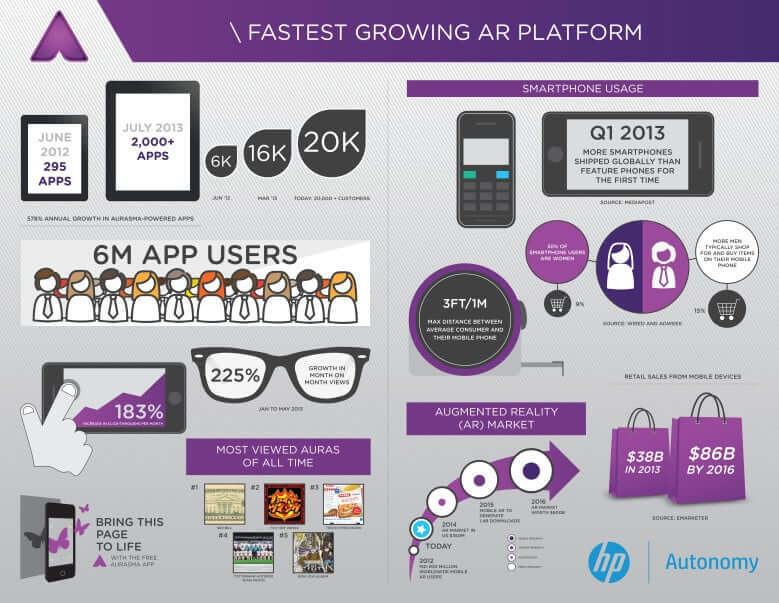 An infographic on ” Fastest Growing AR Platform” is embedded below to get a better understanding of this platform. You too can embed this on your website with the code given below the infographic. These were the Top 20 Augmented Reality Apps which would change your perception to your surroundings and the real world by its applications. This technology augments your smartphone ability to greater heights and is ever reaching more and more with new interventions in it to make your device do such things which you haven’t imagined earlier. Fantastic site. Plenty of helpful info here. I’m sending it to several friends ans additionally sharing in delicious. And certainly, thanks to your sweat! I simply want to tell you that I am just very new to weblog and truly savored this web site. Most likely I’m going to bookmark your blog . You definitely come with outstanding articles and reviews. Thanks a bunch for revealing your web page. The way I see it, you have 12 augmented reality apps, and 8 apps (translation, color picker, compass(2), nav(2), maps(2)) which aren’t augmented reality. Among the apps that ARE augmented reality, you have (a) Furniture modeling, (b) Augmented City(5), (c) Future(Sun seeker), (d) Game(2), Self-Monitoring(Driving), and Space(2). Sounds like the concept is moderately successful, with Augmented City being the most common type of AR application. Pingback: Mobile marketing opportunities for today's marketers. You don't have to be an expert! thanks for such an informative blog on the subject…also if you could help me with the top apps (available and user base) in India…one I know if is Times Alive (if at all you call it AR)..
Ar apps based in India is like you mentioned the Times Alive being topmost of all right now but there are digital media brands in India working in this department for more apps like these like Blink Solution ( http://blinksolution.com/), Adstuck ( http://www.adstuck.com/), Hungama, Gamooz, Telibrahma and more. You can have a visit at their respective websites for more information. Ar apps based in India is like you mentioned the Times Alive being topmost of all right now but there are digital media brands in India working in this department for more apps like these like Blink Solution ( http://blinksolution.com/), Adstuck (http://www.adstuck.com/), Hungama, Gamooz, Telibrahma and more. You can have a visit at their respective websites for more information. Alive is Adstuck’s app and they are really good. Its a great AR app ! Augmented Reality apps are fast and crash proof, and have features like offline object recognition where the user does not even need internet connection to access the digital content. The advances in tech have made experiencing AR advertising and entertainment very hassle free and simple. Many platforms are available in the market right now. Every app has its unique features. Download free app on your iOS and Android devices to test it. Sun Seeker is one of the best apps out there for photographers and cinematographers. Knowing the exact minute you will lose the sun to a big shadow can help you schedule lunch for when there is shadow, for example, and that can make all the difference on a shoot day. You only build a house once in a while, but shooting outdoors is a regular occurrence for a lot of people. I’d say it’s the bigger use for the app. Augmented reality is known to add enhanced effect to the games and game playing experience. Most sophisticated AR game development can deliver games with enhanced visual quality, graphic additions, and more sound effects. While in a computer or mobile games immersive experience is the most sought after aspect by seasoned gamers, augmented reality game development can just fulfill their appetite for the robust gaming experience. Augmented reality game development companies mainly string together design elements and technology to make the game simulate real life visual, audible and perceptible aspects with augmented or enhanced effect. AR game development companies are now offering really immersive platforms to make player interact within the game in a livelier way.